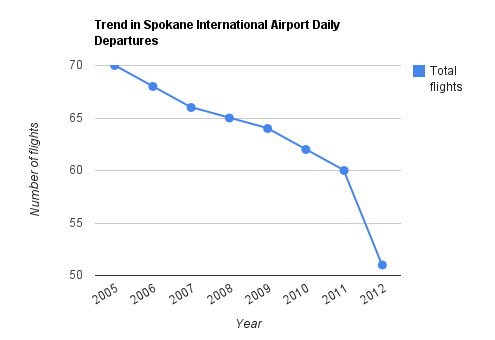 Hopefully the long term decline in air travel to/from Spokane can be turned around. The following charts are generally months to 2 years old and have not been updated since their creation. In a broad brush sense, the charts are still close to today’s operations. See notes, below. The majority of flights from Spokane are to Seattle, Portland and Denver. 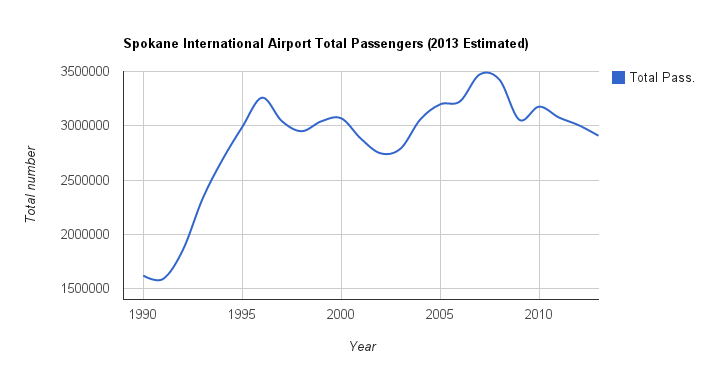 Since this chart was made, the number of Denver flights has gone down a bit. After Southwest dropped out of the Spokane-Seattle market, the number of flights fell to 16 but will rise again to 20, this fall, with the addition of the Delta flights. Next chart correct through 2012. Has not been updated since. In the following chart, two additional non-stop destinations have resumed service – a government subsidized daily flight to Los Angeles and a once per week flight to Hawaii, although that may be going away. 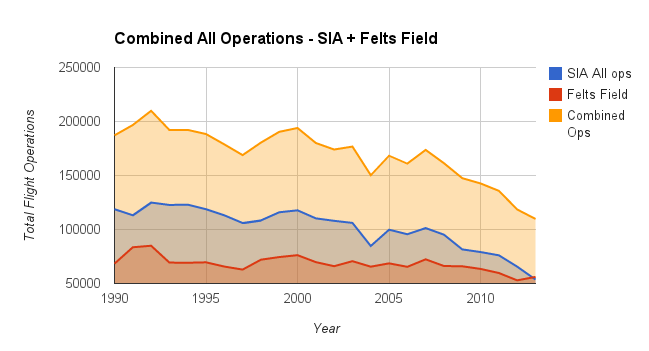 This chart shows only year round destinations so the seasonal Hawaii flight would not be included anyway. Since the beginning of the year, there has been a slight increase in passengers versus last year. An update to this chart would show a slight upward curve at the end. UPDATE: Since this was posted, Ambassadors Group announced the lay off of 40 workers. Ambassadors Group is based in Spokane. In recent years, their annual revenue has been cut in half, founding executives departed without a meaningful explanation, and the company put its newly constructed corporate headquarters up for sale. The analyst notes positive developments such as tight control on expenses and the company continues to pay a dividend. Some executives have recently increased their shareholdings suggesting a sign of confidence in their strategy. On the downside, this analyst notes the business relies on shady marketing techniques, and the number of students enrolled for 2014 travel programs has fallen by 12% from 2013, as previously enrolled students are withdrawing from the programs. The analyst’s concern is that enrollments are continuing to drop and the firm will eventually run out of cash. The 6.6% dividend is well above market averages and is a sign of risk. This raises some doubts on the true value of the building. If company is unable to sell it for the indicated price and is not renting-out the unused half, maybe there is no demand for such office space in Spokane and the value of the building is significantly less than $11.9m. The analysts main concern is long term declining enrollments indicate the turn around strategy is not working and the firm will eventually run out of cash. 85% of the company’s 218 employees are based in Spokane. My take is that I would not rule out a turn around; however, numerous years of year-over-year declines in sales/revenue is worrisome. During this decline, revenues have been cut in half, total assets are down by a third, and net income was negative in 2013. Couple that with an on-going struggle to maintain enrollments and revenues, this makes for a difficult situation. Zillow.com is an online service that publishes information about homes. Not just for sale but also those that have sold, or are in foreclosure. Zillow also tracks changes in the local market. The city of Spokane housing market is rated 1.6 out of 10 on their proprietary market health scoring system. Spokane County is rated 1.4 out of 10 with an average listing time of 136 days. The scale goes from 1 to 10 where 10 is a very healthy market. All of the above are flagged as “downwards” trending. Their scoring system looks at days on market, foreclosures, delinquencies, negative equity, changes in home values, and trends in the days on the market metric. But they do not explain the details of how their proprietary scoring system works. 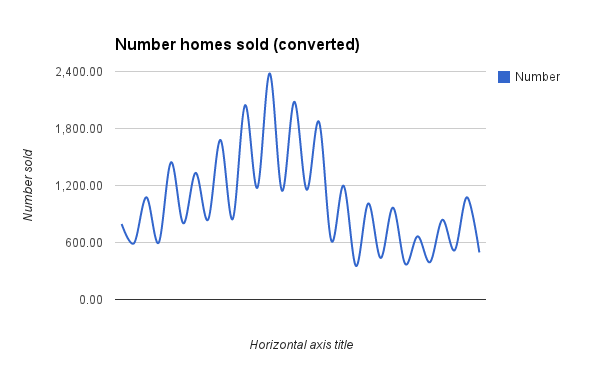 The web site Trulia.com provides a chart showing the longer term number of home units sold trend. Unfortunately, the chart uses a logarithmic scale for the Y-axis, which greatly distorts the chart. Here is a version of the chart converted to show the trend, but using a linear Y-axis, making it easy to see the true trend over time. Not shown on the X-axis, below, are the years 2000 to 2014, corresponding to the X-axis shown above. The chart below, ends at the low point for 2014. Obviously, the number of homes sold will increase through the spring and summer. The second chart was made by converting the original data chart into numeric values, using a program that extracts approximate data points from charts. The extracted data points are used in a spreadsheet program to redraw the chart or perform other analysis. The conversion produces values that are close to the original but it is not possible to recover the exact data used in the original chart. However, the approximation produces a valid summary of the long term trend. It is assumed this refers to the number of homes old per month, but Trulia does not specify. This chart was created in response to several questions received about the current real estate market. Did Spokane really see an increase in tourism related jobs? We previously covered how a decline in passengers and airplanes at both main airports is widely described by area “leaders” as “continued growth in aviation“. Only in Spokane’s bizarro world is a decline considered growth. Now we seem to have another example of decline = growth. Here is a chart of employment change in Spokane County from March 2013 to March 2014. This data comes from the Washington State Employment Security Department (ESD) which gets its data from the US Bureau of Labor Statistics. Tourism is most closely connected to the hospitality (hotels) and restaurant sectors, and a tiny, tiny bit to the retail trade sector. Note that employment in retail trade is down by -200 jobs year over year, employment in the hospitality (hotels) sector is down by -900 and employment in drinking and eating establishments (restaurants) is down by -200 year over year. In fact, retail sales tax collections are down 2 percent for the early part of 2014. Visit Spokane announced that Spokane County added 180 jobs in the tourism industry last year, in local retail stores, restaurants, hotels and more. Visit Spokane staff said Washington’s growth in the tourism industry is still slower than the rest of the nation. Visitors to Spokane have increased so much that Visit Spokane closed its downtown visitor information center in October of 2013 and replaced it with a kiosk in the Riverfront Square mall. Watch the pea under the thimble. They seem to have lumped together “retail stores, restaurants, hotels AND MORE” to come up with an increase. Yet the proxies for visitors are most closely correlated with the hotel industry and food services, both of which are down year over year. Perhaps they found a different set of dates over which to do the year over year comparison, rather than the most recent 12 month period for which data is available. Visit Spokane has a history of making things up and contributes to the image that Spokane remains the scam and fraud capital of America. This is not a good thing. Convention center attendance is in long term decline. 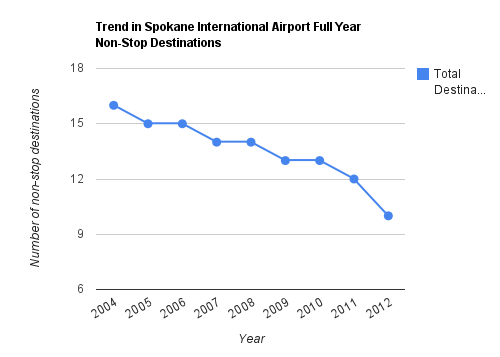 By objective measures, Spokane tourism is not doing so great. Hospitality (hotels) industry employment in the City of Spokane since 1993 (data from US Bureau of Labor Statistics). Hospitality employment is on par with about a dozen years ago – in other words, no growth in a dozen years. We think Hoopfest has shown an increase in attendance and could be another proxy indicator; however, data on long term registrations was not readily available and the crowd size estimates are not reliable. Just not seeing a big growth in tourism related businesses in the area. 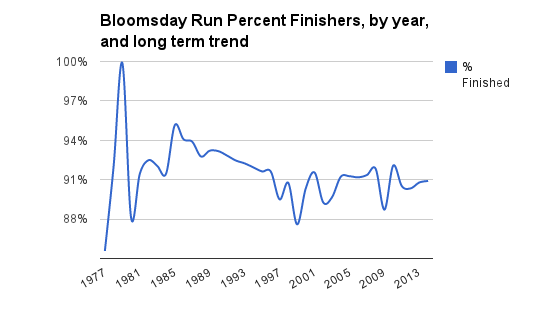 Data comes from the Bloomsday web site except for 2014, which comes from the official Bloomsday Facebook page where they posted the totals. Participation increased from 2004 to 2011, but thereafter, the number of participants has been in decline. 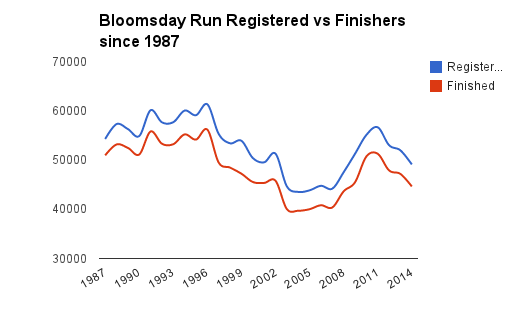 Next chart shows the percent of registered participants who completed the event. 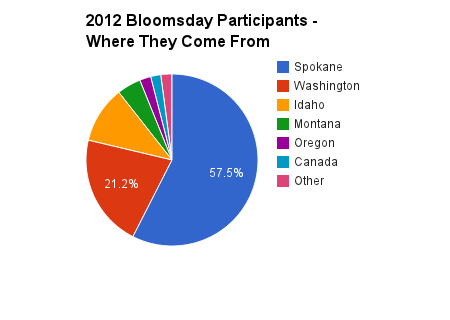 Where do Bloomsday participants come from? This chart is based on data for the 2012 event. 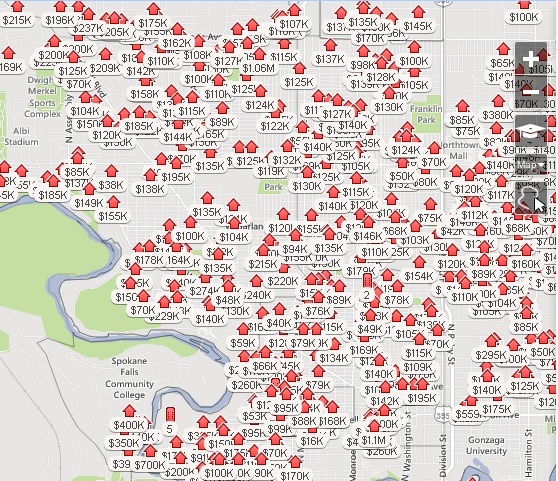 Here is a map showing homes for sale, as drawn by Zillow.com. This excludes homes in foreclosure or bank owned properties that are not yet listed; adding in those homes increases the number by about one-third. This is just one area in North Spokane. From a sampling of listings on Zillow, many homes have asking prices close to or well below their original purchase price going back as much as ten years. Many homes bought since 2005 are having a hard time. For the seller, add in 6% commission, plus maybe 2% expenses of sale and closing, and possibly an additional 2% for buyers demanding the seller pay a part or all of their loan costs and Spokane real estate sellers are having another tough year – that’s another 10% cost after taking a loss on the sale. Spokane promoters push the “cheap housing” meme. But buyers should consider why homes are cheap – and often becoming cheaper in recent years. See “Update” after the chart. In a tough market, buyers can push for and often get “seller concessions”. For example, a buyer can demand that the seller pay not only all closing costs (versus splitting this 50:50), but can have the seller pay the buyer’s own loan costs including “points” and other loan fees that can amount to thousands of dollars. These concessions do not (often) show up in the officially recorded sale price. For example, a home receives an offer for $150,000. This is the officially recorded price of the home at sale. However, as part of the offer, the buyer demands that the seller pay all closing costs and $2,000 of the buyer’s loan origination costs, plus the costs of inspections. Because the market is weak, the sellers often concede and eat the costs. The effect of this is the “real” sale price is $145,000 (or less). But in the official records, the price is recorded as $150,000. Even though from the seller’s perspective, the real price is $150,000 minus a $5,000 discount. This keeps the median price high and the realtors still get paid their 6% commission based on the fictitious $150,000 sale price. By keeping the median price higher than it actually is, realtors can issue misleading price trend reports making home prices look higher than what the actual market clearing price has been for actual homes. Because of the commission structure, they have a built conflict of interest bias is encouraging these types of transactions. A lot of variables go into the market price of a home. The price of a home is not just the price of the home – it also includes the current price of money. Interest rates are the “price of money”. When the price of money is cheap, the price of the home can be higher than it otherwise would be – or the buyer can choose to buy higher priced, more upscale homes. For most home buyers, all that matters is the total monthly payment which is determined by the home price, the size of the loan, and the current interest rate. Obviously, other factors impacting home prices include the local economy and job growth/income growth, and the supply of homes. In a flat or down market, however, buyers can seek seller concessions, described above. This creates an artificial “median sales price” that is higher than the true market price. The “median sales price” is the value put out in press releases by the local real estate sales agents associations – but as you can see, the official median sales price may not be an accurate reflection of the market, especially when sellers are making “off the record” concessions to the buyers. The median price is also influenced by the mix of homes that are selling – lower interest rates can lead to buyers choosing more expensive homes (for the same monthly payment), driving up the median. Another example of how seller concessions are hidden from buyers of other area properties. Basically, a buyer relies on their real estate sales agents input on selecting a bid price. The agent shows the sales price of local homes but does not disclose the VA/FHA loan fees being paid by the seller. The buyer sees an inflated and untrue price for the local homes and therefore, ends up being tricked into making an offer above a fair price . If a client is hesitant about offering too much, an agent will sometimes share rosy predictions about where the market is heading. The National Association of Realtors is usually a good source of overly optimistic market forecasts.